I’m writing this on a short train journey. 5 hours. 5 hours is a short one. Just time to justify getting the laptop out. Less than that, and it’s feels like too much hassle. Get your head around that. Time stretches and shrinks on trains. Especially trains like these. If 5 hours is a short one – yesterday was two long ones: 7 hours of mountains and lakes, then across twenty feet of damp platform, and off for 14 more, mostly forest, as we travelled from deep inside the Arctic Circle to Stockholm. And I’m here to take pictures. Of anything. Wherever. For variety, using a combination of my standard SLR, a Canon G15 compact, and my phone. Mixing them around in each day’s record to vary the visual feel and tickle up some creativity. But what, you may ask, is there to take photos of? And aren’t there some challenges trying to get decent pictures from inside a speeding train? Because we’re hardly getting off trains on this monstrous adventure, the answer to the latter question has been at the front of my mind. Other than the few dashes through a station concourse, or at a rest stop to pick up passengers in a far-flung Scandinavian village, dealing with thick, grubby train windows has been a regular feature. And on the question of content, my aim has been to produce a couple of dozen shots each day, no more, going for quality over quantity. This isn’t a study tour of fjords or mountains; keeping just a couple of good ones as we go through spectacular scenery has been an interesting discipline. Mixing up people, places and things is important too. 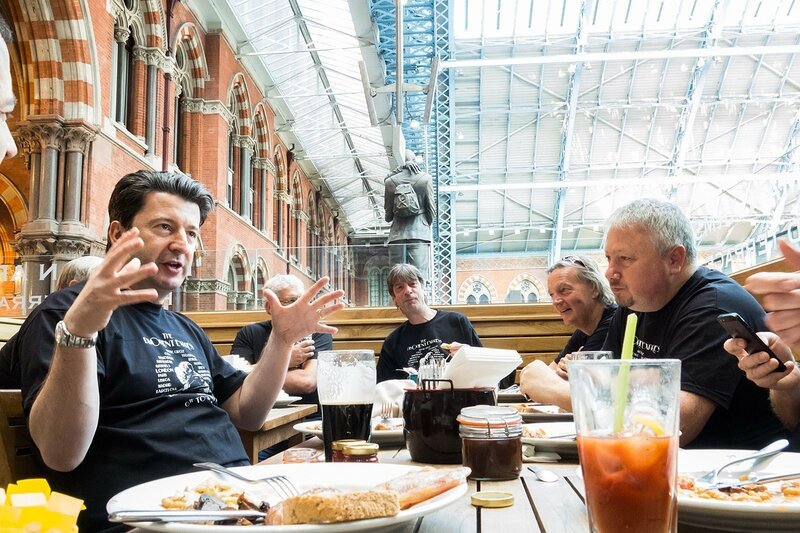 This is a social adventure – a dozen travellers, most strangers when they met in St Pancras on Saturday, make for fascinating people moments. And I’ll have to live with the consequences of anything I publish on that side of things. Literally, at least for the next couple of weeks. So, trains, certainly. And some landscapes. Accommodation. Ephemera. And mood. The long, hot days. The struggles. Low points. Tedium. Yes, much here in terms of subjects, even if it requires working at them harder than pretty much any previous assignment I can think of. A few examples then from our first two days of the Great Circular European Railway Challenge, with some technical notes for those who like that sort of thing. Taken with the G15 (and note that in these posts, focal lengths have been converted to standard 35mm camera equivalents). I’m really liking this as a travel camera. It’s small, discreet, and I’m pretty much always using it in manual. The interface is very consistent with its big brother, the 5DIII in my belt pack. Shooting in RAW means I can recover lost highlight detail as with this one, placing us in St Pancras enjoying our departure fry-up. 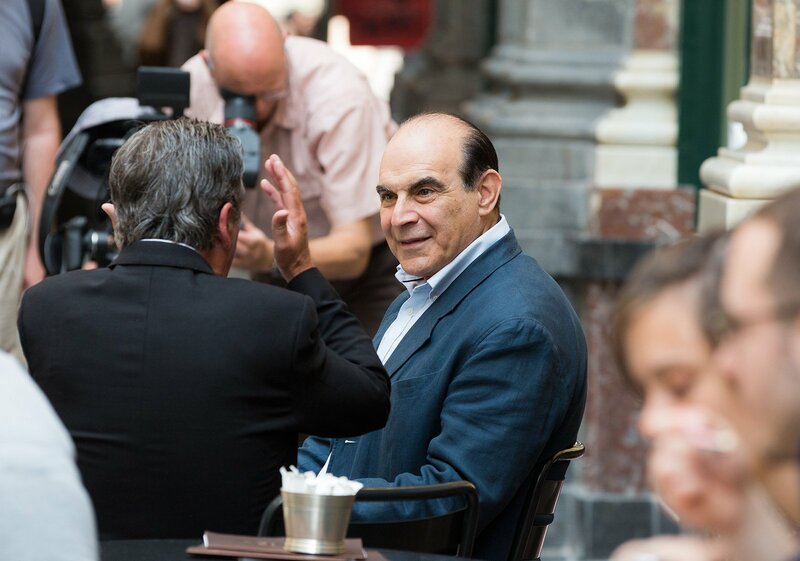 In Brussels, hopping between supermarkets and chocolate shops, having terrible hackneyed conversations about famous Belgians – and then we see one. Well, the actor who plays him, anyway. In a flash, the big pap telephoto comes out. Nothing like it for getting this sort of clarity from a dozen yards away in a crowded arcade. 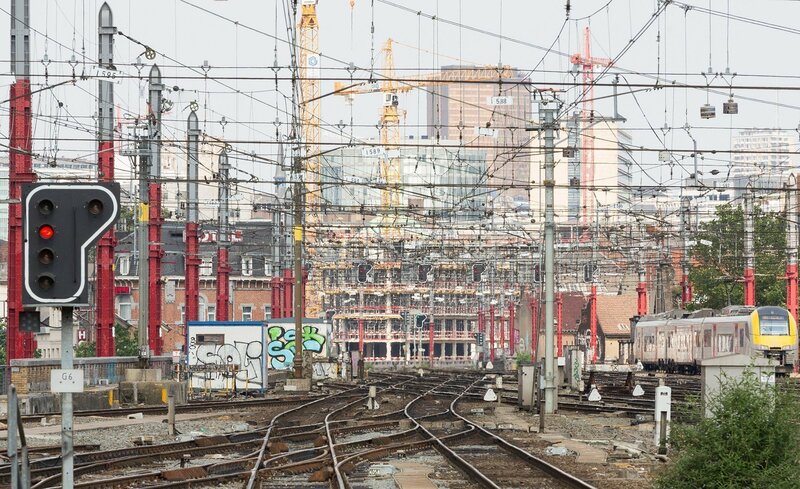 Still in Brussels, the baroque wiring at the main station intrigued me; the geometry corrupted by the heat haze on a scorching day. This one’s all about telephoto compression – the ability of a long lens to bring far away objects not just closer, but seemingly nearer to each other. Straight lines show kinks; repetition and distortion weave together. Might end up being a big print, this one – there’s so much detail in there. And on a train…leaving Amsterdam, the cheery intimacy of this moment made my phone camera (Galaxy Note) by far the best tool for the job. High angle, auto mode, hit and hope, but just the texture and feel I was after. 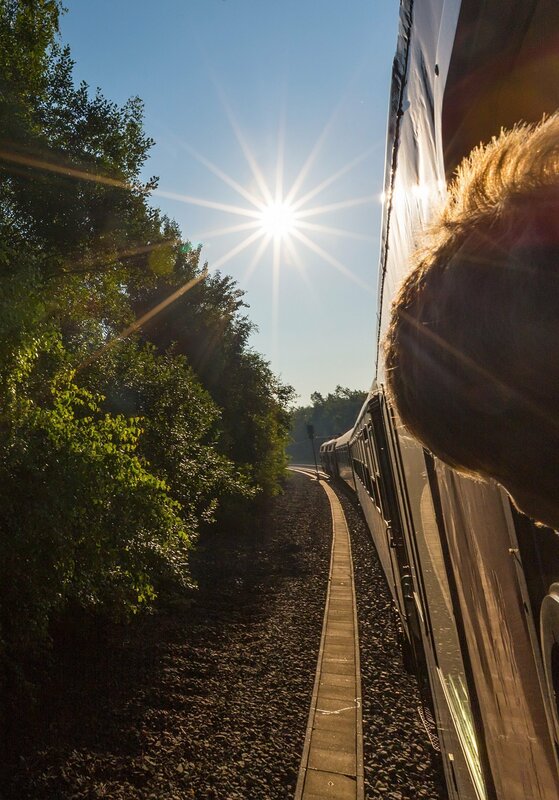 A boy puts his head out of the window – one of the few trains that’s allowed us to do this. I follow, and with a tight aperture, fast shutter and low ISO to choke down the intense sun, I shoot into it as we round a corner. Pleasing compositional balance, and the star effect around the sun the result of a good quality lens stopped down. 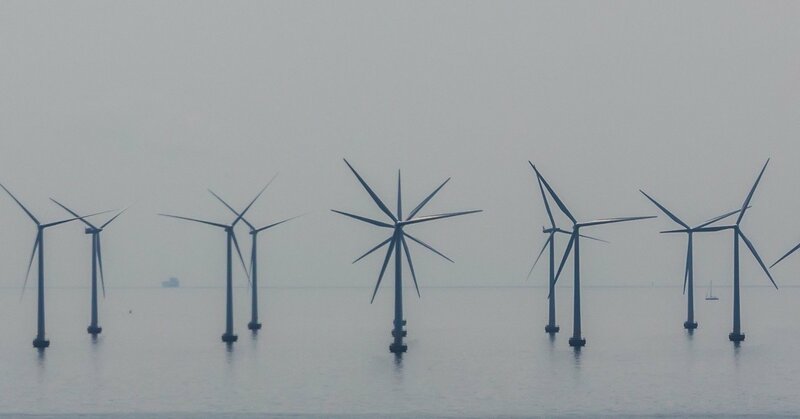 Heavily cropped, because the turbines were so far away, but catching that exact moment when the structures became the multi-armed Hindu god of the Denmark/Sweden strait. Lots of adjustment of contrast, clarity and sharpness in post to bring the image out of the haze, and through the muting of thick window glass. Here’s the full photo collection from the tour as it develops, day by day.